For young Iris, the whole world looks upside down, and the only person who truly understands and appreciates her perspective is her new friend Charlie, who has his own unique trait: he cannot speak. His silence, her precociousness, and their acceptance of each other make the two a perfect match. But happiness is fleeting, as Iris’s new stepsisters, skeptical and jealous (as conventional folks often are of those who dare to swim against the tide), manage to drive the two apart. Iris and Charlie are separated for the remainder of childhood. Grown-up Iris never forgets about Charlie, though, and her love for him influences the charming art gallery she now owns. But despite the visually magical environment she inhabits, Iris finds herself doubting Charlie once again, thanks in no small part to those pesky stepsisters of hers. Still, before she decides to give up hope altogether, she decides to do one small thing for the other lonely souls around her . . . with wonderful consequences. 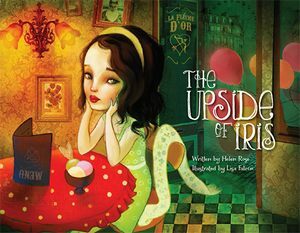 The Upside of Iris is an illustrated love story for all ages, and for anyone who has ever felt misunderstood. It is a whimsical, touching reminder that perspective is truly everything, and that a change in perspective can make all the difference in the world.